department for the Hong Kong subsidiary of one of the world's largest general insurance groups, Peter has also worked for the regulatory authorities inHong Kong and as a private practice commercial litigation lawyer in the City of London. During his career, Peter has been responsible for implementing anti-money laundering and anti-fraud compliance systems, dealing with ICAC investigations and litigating complex financial frauds through both the English and Hong Kong courts. Peter Gregoire has been writing fiction since 2006 and his stories have been published in a wide range of anthologies. His short story, 'Dispute Resolution', won the senior category prize in the 2008 Standard/RTHK competition and a consultation with Pan Macmillan. Article 109, a fast-paced financial crime thriller in which Peter draws on his inside knowledge of working in the financial services industry and his experience of the subtle political and economic relationships between Hong Kong and China, is his first full-length novel and Winner of the International Proverse Prize (2011). Gregoire currently lives with his wife, Isa, his son, Luke and his oversized basset-hound, Dumbo, inHong Kong. In 2017, PETER GREGOIRE's book on reverse mentoring was launched. Reverse mentoring has been doing the rounds in the corporate world for some years now, where it is used to introduce senior management to new technology and social media as business tools. Yet this only scratches the surface of what reverse mentoring can achieve. ﻿Throwing two generations together in a reverse mentoring relationship creates one of the most powerful problem-solving dynamics at our disposal. It also provides a means for lifelong learning and controlled imagination. Most importantly, it can act as a key step in the character development of both participants and an opportunity for both to reflect on their true purpose in life. 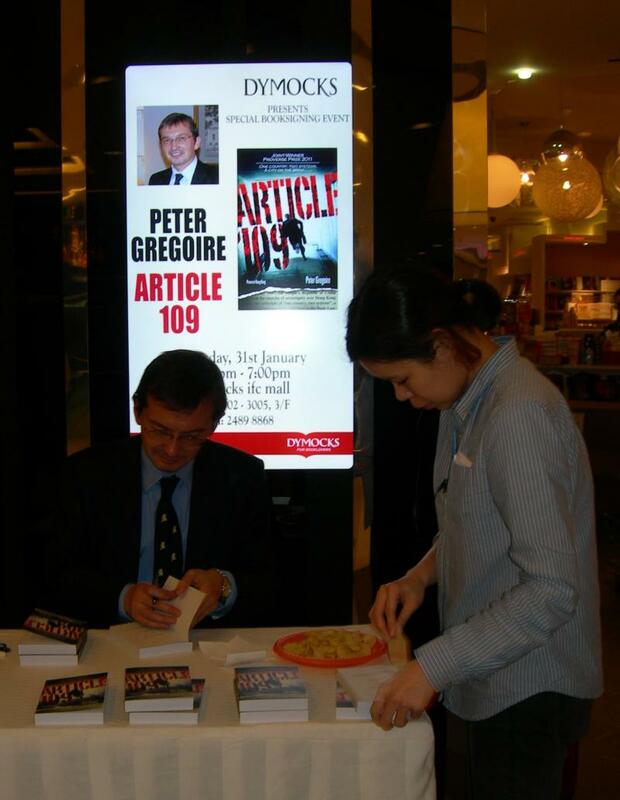 A book-signing by prize-winning and best-selling author, Peter Gregoire, took place at IFC, Hong Kong, on Thursday, 15 January 2015. 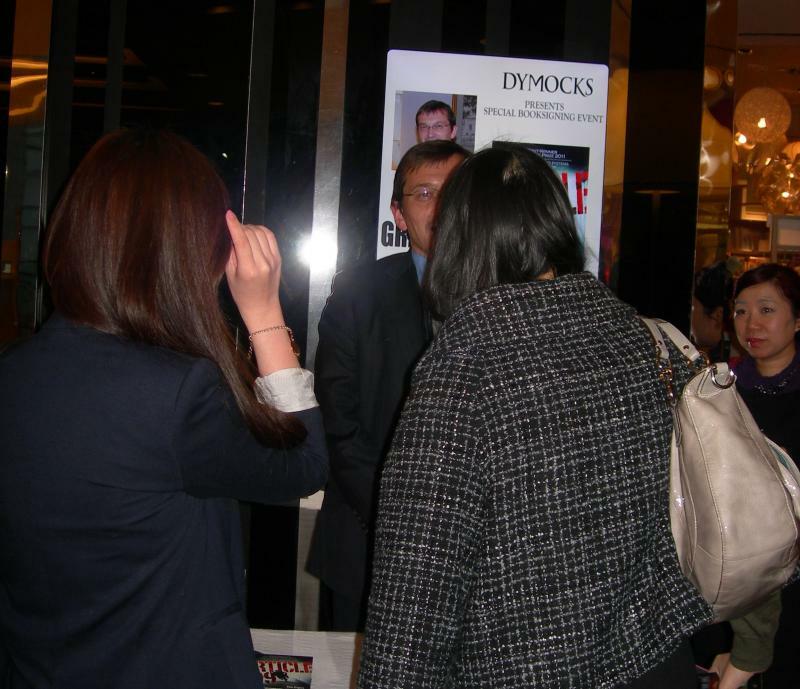 His second Scott Lee mystery novel, "The Devil You Know", was warmly received.. The Devil You Know is Peter Gregoire’s follow-up to his well-received first novel, the legal thriller set in Hong Kong,Article 109, joint-winner of the international Proverse Prize 2011, which reached Number One on Dymocks list of best-sellers. The author, Peter Gregoire works as a legal counsel in the Hong Kong financial services industry and is an Honorary Lecturer at theUniversity ofHong Kong. Set in Beijing and Hong Kong, ARTICLE 109 is a high-octane, page-turning thriller. A young solicitor, investigating the suicide of his former colleague, unravels a conspiracy to cause chaos on the financial markets by instigating the downfall of one of Asia's richest tycoons. ARTICLE 109, Joint-Winner of the Proverse Prize 2011, lifts the lid onHong Kong’s fragile status as an international financial centre and the role it plays inChina’s unrelenting march towards becoming the most powerful global economic superpower. 5.0 out of 5 stars Thoroughly enjoyable, 28 Dec 2012 By "Eastlife"
This modern-day legal thriller was a surprise page-turner. Set inHong Kong, the ever-thriving financial hub of Asia, its clever plot and suspenseful storyline is sure to keep you hooked. I liked the well-compartmentalised structure of chapters, which made it easy for me to follow through. I would recommend this book if you like crime fiction with a contemporary twist. An exciting and well crafted novel. The division of the book into relatively short chapters racks up the continuing suspense as each chapter ends on a tantalising note with the reader wanting more. The absence of any major sub-plots concentrates the reader's attention on the main gripping story. The detailed description of locations and events enables the reader to visualise the action as it takes place, especially for those who knowHong Kongwell. The author certainly knows his stuff! The nail-biting climax certainly parallels the best of time honoured crime fiction.